His wife, Marcia Wright, said the cause was acute myeloid leukemia. Dr. Wright, who was the Vilas distinguished research professor of sociology at the University of Wisconsin, spent his entire teaching career at Madison, starting in 1976. His presence was a draw for students and helped the university’s sociology department maintain its place for decades as one of the premier departments in the country. While immersed in theoretical aspects of social class and social change, Dr. Wright also delved into real-world challenges like poverty, income inequality and unemployment. His venue was often the A. E. Havens Center for Social Justice, which he established to bring in visiting scholars to discuss progressive ideas. He wrote hundreds of research papers and published 15 books. A 16th, “How to Be an Anti-Capitalist for the 21st Century,” is to be published this year. Part of a circle of intellectuals that prided itself on being nonideological — as distinct from doctrinaire Marxists — he believed in open debate and empirical evidence. One of his most ambitious books was “Envisioning Real Utopias” (2010), in which he offered alternatives to capitalism. He championed, for instance, what is known as a universal basic income — an automatic, periodic cash payment from the government to all adults, regardless of their economic standing. He also promoted participatory budgeting, in which community members decide how to spend a portion of a public budget. “His ideas captured the imagination of audiences, intellectuals and activists across the globe, making him one of the most distinguished critical social scientists of our era,” Michael Burawoy, a friend and a leading Marxist sociologist at the University of California, Berkeley, said in an email. Dr. Wright saw one such utopia in Wikipedia, which relies on unpaid editors and is free. He likened it to worker cooperatives and community land trusts. Dr. Wright’s other main interest was class structure, which underwent a major transformation in the 20th century with the expansion of the middle class. “He pushed leftist thinkers as well as social scientists to think in more nuanced ways about broad categories like ‘class,’ ” Gay W. Seidman, a sociologist at Madison, said in an email. Dr. Wright posited, for example, that many managers participate in controlling the working class while being simultaneously controlled by capitalist owners; in other words, these managers are essentially exploiting others while also being exploited. This ambiguity led to his theory of “contradictory class location,” now a core concept in sociology textbooks for understanding class conflict and political alignments. “He brought the Marxist theory of exploitation up to date, by recognizing intermediary classes between capitalists, workers and self-employed,” Dr. Burawoy said. In recent years, Dr. Wright’s focus had shifted “to the democratization of the economy and to the ruling class,” said Mitchell Duneier, a former Madison colleague who is now chairman of Princeton’s sociology department. In addition to scholarship, Dr. Wright loved teaching, and his courses attracted many non-Marxists. When he accepted the university’s distinguished teaching award in 1998, he said his best ideas came from dialogue with students. 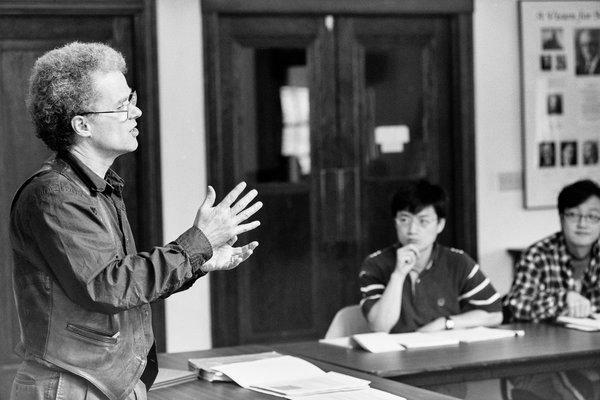 Erik Olin Wright was born on Feb. 9, 1947, in Berkeley, Calif. He grew up in Lawrence, Kan., where his father, M. Erik Wright, and his mother, Beatrice Ann (Posner) Wright, were professors of psychology at the University of Kansas, although his mother’s appointment was delayed several years because of an anti-nepotism policy. Erik was planning to attend the University of Kansas and, because of his advanced studies, would have entered as a junior. But a family friend gave him an application to Harvard as a gift. He applied and was put on the wait list. In the meantime, he won first place in mathematics at the 1964 National Science Fair (now called the Intel International Science and Engineering Fair) with a project on Möbius strips. He was accepted at Harvard, received his bachelor’s degree in social studies in 1968 and studied history for two years at Balliol College, Oxford. He met Marcia Kahn at Harvard; they married in 1971. In addition to his wife, Dr. Wright is survived by two daughters, Jennifer Wright Decker and Rebecca Wright; a sister, Colleen Rand; a brother, Woodring Wright; and three grandchildren. During the Vietnam War, Dr. Wright received a deferment from military service to attend a training school in Berkeley for Unitarian ministers. He also worked as a student chaplain at San Quentin State Prison. He earned his doctorate in sociology in 1976 from Berkeley and was immediately recruited by Wisconsin. Berkeley tried to lure him back in 1987. But Madison was determined to keep him and sought to negotiate a package that “he would find irresistible,” according to Russell Middleton’s two-volume “History of Sociology at the University of Wisconsin-Madison” (2017). Dr. Wright surprised the administration by saying that he was not interested in discussing salary, Dr. Middleton wrote. Instead, he said, all Dr. Wright wanted was a sociology center that would bring in visiting progressive scholars. The department agreed and created the now-renowned Havens Center. And it kept Dr. Wright in Madison for the rest of his career. Previous PostPrevious Will Brexit Make You Hangry?